widely shared and used by media outlets across the world. The image was one that spoke of love and determination. In mid-March, a student sheathed in a blue scarf took an exam on the floor of an outdoor classroom in provincial Afghanistan with a baby lying across her lap. Yahya Erfan, a professor at the university where the exam was taking place, took a photo of the scene and posted it to his Facebook account. 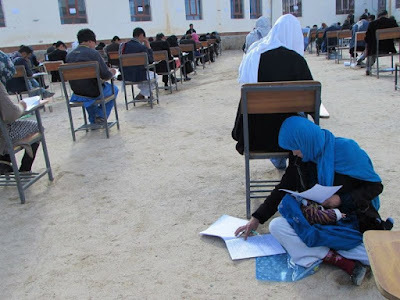 The 25-year-old woman in the photo, Jahantab Ahmadi, sat cross-legged, her face bent over her exam papers in concentration as her two-month child bawled due to an earache. 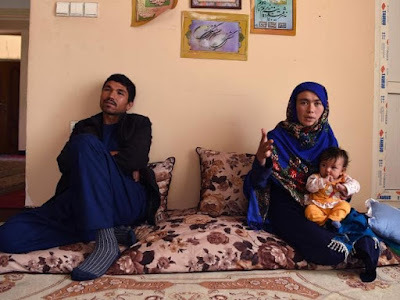 Jahantab, a mother-of-three, hails from the remote settlement of Hoshto, in the Miramar district of Afghanistan’s Daikundi province. To sit the exam in the provincial capital Nilli, Jahantab had to travel two hours on foot over coarse mountainous terrain and a further nine hours on public transport along a rough, bumpy road. The photo became a source of inspiration for social media users in a country where timelines are too often full of the news of bloody attacks. Despite coming from a conservative society, where many men oppose women’s education, Jahantab is fortunate enough to enjoy her family’s support and admiration. Her husband, Musa Mohammadi, who comes from a poor family, has been a vital pillar of support. Shortly after the photo appeared on social media, the pair had reason to celebrate — Jahantab passed the university entrance exam known as the kankor, scoring 152 points out of 360. Jahantab’s story triggered offers of financial help both inside and outside the country. One UK-based organization, the Afghan Youth Association, recently launched an online GoFundMe campaign to help pay for her university fees. The campaign has so far raised more than $14,000 – a fortune in a country where about 39 percent of the population lives in poverty. Thanks to the campaign and other funding, Jahantab is now enrolled at a private university in Kabul where she majors in Economics. Afghan social activist Zahara Yagana was a key mover in attracting aid to Jahantab's cause and has been posting updates on the young student's progress. This inspiring story, written by Maisam Iltaf, was first published on Global Voices Online on 4 April 2018. It is republished with permisison.